The chosen venue for these celebrations was traditionally a crossroads, a meeting point which would later become the setting for fairs and “romerías” alike. 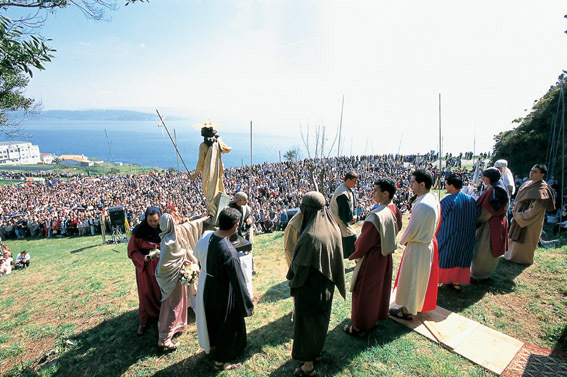 A setting that would inevitably include a “cruceiro” (stone cross), a traditional religious symbol, or a stone altar with a collection plate for alms, the “peto de ánimas”, in memory of their forefathers. The sites chosen for the “romerías” to a religious shrine included woods, carballeiras (oak woods) facing the sea, the banks of a river or before one of those huge stones or springs believed to hold “miraculous” properties and that have been the object of cult since time immemorial. These areas are presided over by the temple, the shrine where the faithful flock to worship an ancient image and leave their offerings. Lands that stretch out into the distance, such as those of O Faro, close to Chantada, A Guarda or Tegra, in the province of Pontevedra, O Pico Sacro, just outside Santiago de Compostela; or O Viso in Lobios, province of Ourense. Settings where we also find the springs which the local inhabitants claim have special healing powers, such as those of Fonte do Rial close to the Shrine of Santo Ourente of Entíns in Serra de Outes in the province of A Coruña; or San Andrés de Teixido in Cedeira, where ” ó que vai de morto o que non foi de vivo” (“those who failed to go in life will go in death”) and so it goes on, in keeping with a spiritual exercise bound by tradition: Pastoriza in Arteixo; in Pontevedra and in the borough of A Cañiza, the Shrine of A Franqueira in the borough of A Cañiza, in Pontevedra; Los Milagros de Amil in Moraña, in the province of Pontevedra; Nosa Señora da Lanzada in Sanxenxo; O Corpiño in Lalín; Outeiro de Rei, in the province of Lugo, the field of Santa Isabel on the banks of the River Miño; in Ourense, the Shrine of Os Milagros of Maceda… Open spaces shrouded in legends, apparitions and healings in which the sense of pantheism can truly be felt; the animism whereby a force animates the inanimate and which characterises both Galicia and the Galician people. It is here that the pipes or the pandeirada (tambourine) sound their sweetest. Traditionally “mordomos”, representative figures from the group, would go from house to house during the festival period to collect a gift, which they would then hang from a branch, normally taken from a laurel bush, and later auction off. Today the system has changed; a committee is responsible for ensuring that the interests of all are attended to, thereby guaranteeing the success of the celebrations. Music is an essential element, and these festivals provide local bands, choirs and folk groups with the perfect audience for their performances. Flags and street lighting are also omnipresent. And as night falls, no celebration is complete without the ubiquitous “folión” or firework display. The “folión” held on the eve of the Day of the Apostle, in Santiago de Compostela, is a larger version of the same interest in celebration that drives many of Galicia’s towns and villages. An element of trade is also present in Galicia’s festivals and religious celebrations. They represent a time of coming together and provide the perfect opportunity to sell Galicia’s finest produce and crafts, as well as other goods of more distant origin. The atmosphere is one of harmony and fraternity. With the arrival of autumn, the festivals and fairs of San Froilán in Lugo or San Lucas in Mondoñedo represent the drawing to a close of the summer, and the preparation for shorter and darker winter days.